Welding provides readers with cleanly designed and concise chapters. Essential coverage of safety, theory, key skills, easy-to-read reference charts and tables, detailed step-by-step procedures, and a strong emphasis on the diameter of electrodes is covered in a simple, yet comprehensive way. 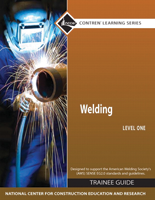 After an introduction to welding and to welding safety, each major welding process is presented in its own chapter so they can easily be discussed in the classroom. Following the weld processes, chapters focus on critical topics such as codes, destructive and non-destructive weld testing, welding symbols, welding metallurgy, welding ferrous and nonferrous alloys, and welding power sources.